The Gilbert Islands (Gilbertese : Tungaru;  formerly Kingsmill or King's-Mill Islands  ) are a chain of sixteen atolls and coral islands in the Pacific Ocean about halfway between Papua New Guinea and Hawaii. 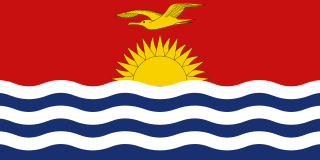 They form the main part of Kiribati ("Kiribati" is the Kiribati rendition of "Gilberts"  ). The Ratak Chain is a chain of islands within the island nation of the Marshall Islands. Ratak means "sunrise". It lies to the east of the country's other island chain, the Ralik Chain. In 1999 the total population of the Ratak islands was 30,925. Marakei is a small atoll in the North Gilbert Islands. The central lagoon consists of numerous deep basins and surrounded by two large islands which are separated by two narrow channels. The atoll covers an area of approximately 40 km². Maiana is an atoll in Kiribati and is one of the Central Gilbert Islands. Maiana is 44 kilometres (27 mi) south of the capital island of South Tarawa and has a population of 2,027 as of 2010. The northern and eastern sides of the atoll are a single island, whilst the western edge consists of submerged reefs and many uninhabited islets, all surrounding a lagoon. The atoll is 14 kilometres (8.7 mi) long and is very narrow, with an average width of less than 1 kilometre (0.62 mi) and a total land area of 16.72 square kilometres (6.46 sq mi). Abemama (Apamama) is an atoll, one of the Gilberts group in Kiribati, and is located 152 kilometres southeast of Tarawa and just north of the Equator. Abemama has an area of 27.37 square kilometres and a population of 3,299 as of 2015. The islets surround a deep lagoon. The eastern part of the atoll of Abemama is linked together by causeways making automobile traffic possible between the different islets. The outlying islands of Abatiku and Biike are situated on the southwestern side of the atoll. Kuria is the name of a pair of islets in the Central Gilbert Islands in Kiribati, northwest of Aranuka. The two islets, Buariki and Oneeke, are separated by a 20 metre wide channel on a shallow water platform, which is crossed by a bridge of the connecting road. The islands are surrounded by fringing reef which is broadest on the eastern side of Kuria. The population of Kuria was 980 in 2010. In the early to mid 20th century the principal source of income for Gilbert islanders was from working on the production of phosphate from the deposits on Banaba (Ocean Island), an island to the west of the Gilbert Islands. In addition, coconut palms were cultivated on some of the islands. All labor was supervised by the British and every effort was made to see that the wages and living conditions were fair and adequate. Sanitary inspections by the British did much to improve the general living conditions on most of the islands. The Gilbert (and Ellice) Islanders had a strong set of beliefs of their own, pre the Christian missionaries; they had a strong foundation myth, involving trees and the two genders. Their ancestors, they said, had been white skinned and red haired and came from elsewhere, perhaps the West (possibly coinciding with the outward spread of Homo sapiens from Africa and elsewhere). As might be expected, they gave power to the natural forces and gave them names and godly characteristics (sun, moon, etc.) but believed in one spirit god, a bit similar to the god of Genesis, in that he/she seemed to have power over dark and light and so on, and was pretty much invisible. They had a strong belief in behaving properly to their ancestors, and especially their parents, and had well-developed community rules for courtesy to others. Read A Pattern of Islands , by Arthur Grimble, who worked in these islands and on Banaba, for the Colonial Administration, from just before the First World War to the mid thirties, or thereabouts. It is a remarkable, informative, funny and warm-hearted account of these people and their religion. Other religions on the islands figure slightly, and there are remarkable stories of adventures, bravery, political machinations, etc. Probably out of print, but second hand copies are available I think, I have two, and the illustrations are delightful. 1 2 Reilly Ridgell. 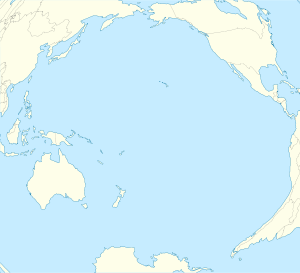 Pacific Nations and Territories: The Islands of Micronesia, Melanesia, and Polynesia. 3rd. Ed. Honolulu: Bess Press, 1995. p. 95. 1 2 Stevenson, Robert Louis (1987) . In the South Seas, Part V, Chapter 1. Chatto & Windus; republished by The Hogarth Press. ↑ Grimble, Arthur (1981). A Pattern of Islands. Penguin Travel Library. Penguin Books. ISBN 978-0-14-009517-3. ↑ Maude, H.E. (1959). "Spanish Discoveries in the Central Pacific: A Study in Identification". The Journal of the Polynesian Society. 68 (4): 284–326. ↑ "Circumnavigation: Notable global maritime circumnavigations". Solarnavigator.net. Retrieved 20 July 2009. ↑ Samuel Eliot Morison (1944-05-22). "The Gilberts & Marshalls: A distinguished historian recalls the past of two recently captured pacific groups". Life magazine . Retrieved 2009-10-14. ↑ Chambers, Keith S.; Munro, Doug (1980). "The Mystery of Gran Cocal: European Discovery and Mis-Discovery in Tuvalu". The Journal of the Polynesian Society. 89 (2): 167–198. ↑ Stanton, William (1975). The Great United States Exploring Expedition. Berkeley: University of California Press. p. 245. ISBN 978-0520025578. ↑ Resture, Jane. "TUVALU HISTORY – 'The Davis Diaries' (H.M.S. Royalist, 1892 visit to Ellice Islands under Captain Davis)" . Retrieved 20 September 2011. 1 2 3 4 5 Mahaffy, Arthur William. Report by Mr. Arthur Mahaffy on a Visit to the Gilbert and Ellice Islands, 1909. London: Darling & Son, ltd. pp. 5–12. ↑ Return to Makin Island iPod Version. YouTube. Retrieved on 2013-07-29. 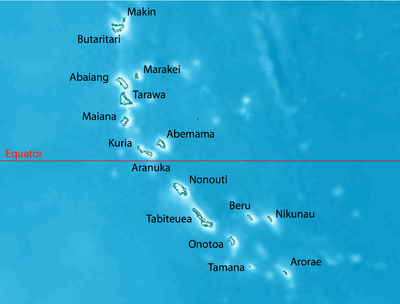 Wikimedia Commons has media related to Gilbert Islands . The first inhabitants of Tuvalu were Polynesians, so that the origins of the people of Tuvalu can be traced to the spread of humans out of Southeast Asia, from Taiwan, via Melanesia and across the Pacific islands of Polynesia. 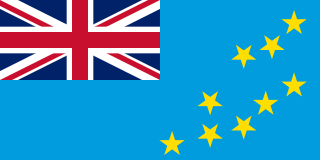 Nui is an atoll and one of nine districts of the Pacific Ocean state of Tuvalu. It has a land area of 3.37 km² and a population of 542. The heart of any Kiribati community is its maneaba or meeting house. The maneaba is not just the biggest building in any village, it is the centre of village life and the basis of island and national governance. Coral Sun Airways is the younger of two Kiribati airlines, established in January 2009. The airline operates domestic service to all 17 airports in the Gilbert Islands. In 2015 it purchased one new, larger aircraft, capable of flying to the Phoenix Islands and Line Islands. 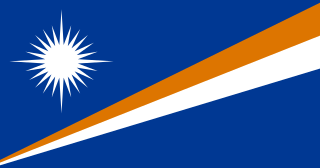 Currently, there is no domestic nor international service to these remote archipelagos to the east of the Gilbert Islands, having 41 and 8,809 inhabitants, respectively, except for one weekly flight on Fiji Airways between Honolulu and Kiritimati (Christmas) Island among the Line Islands. Air Tungaru was the first airline of Kiribati. As the predecessor of current Air Kiribati, it was Kiribati's national flag carrier. Air Tungaru's main base was the international airport at Kiribati's capital, South Tarawa. From there, regular service was provided to all 16 domestic airports in the Gilbert Islands. The Catholic Church in Kiribati is part of the worldwide Catholic Church, which, inspired by the life, death and teachings of Jesus Christ, and under the spiritual leadership of the Pope and Roman curia in the Vatican City is the largest Christian church in the world. Paul Eusebius Mea Kaiuea is Bishop of Tarawa-Nauru, Kiribati. This time line of the history of Tuvalu chronologically lists important events occurring within the present political boundaries of the Pacific island state of Tuvalu. This time line is introduced by the theories as to the origins of the Polynesian people and the migration across the Pacific Ocean to create Polynesia, which includes the islands of Tuvalu. King George V and Elaine Bernacchi School (KGV/EBS) is a government senior high school of Kiribati, located in Bikenibeu, South Tarawa. As of 1993 it has almost 600 students. In 1993 it had a competitive admissions process as there was not enough space for every high school student in Kiribati; the remainder had to enroll in Christian high schools. Since then the Kiribati government had established two additional government high schools. King George V School (KGV) was a government high school for boys in the Gilbert Islands, within the British colony Gilbert and Ellice Islands. Throughout its history it was in multiple locations in South Tarawa and Abemama. It served as a boarding school, and trained people to be government workers and teachers.